For someone who was the editor-in-chief of Vogue for nearly a decade, it’s amazing how well Diana (dee-yahhh-na) Vreeland lived out the philosophy that the best things in life are free. 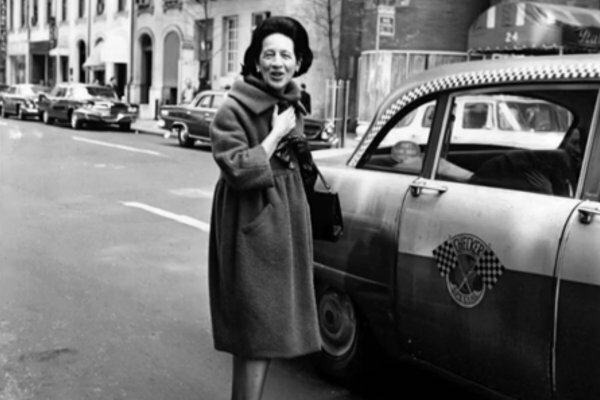 In Diana Vreeland: The Eye Has to Travel, a dazzling fashion documentary directed and produced by her granddaughter-in-law, Lisa Immordino Vreeland, Diana’s legacy is shown to have more to do with imagination, personality and a bit of lunacy than with anything sold on her pages. In a phone interview, Lisa explained that after marrying into the Vreeland family (her husband is Diana’s grandson, Alexander), she knew that her grandmother-in-law, who many say invented the role of the modern fashion editor, had to be captured and passed down to future generations before she faded from the cultural zeitgeist. Her first thought was to write a book, but after hours spent burrowed in the Paris libraries of Harper’s Bazaar and Vogue poring over issues Diana styled and conceived, she realized that bound pages would not suffice. The only way to honestly capture Diana was by letting viewers hear her voice and see her work. Lisa was prepared to discover a different side to Diana other than her eccentricity and hyperbolically glamorous fashion spreads (think models in couture gowns scaling the sides of Russian cathedrals). But what she didn’t expect was how open Diana was to other people and ideas from low culture as well as high. In a flurry of nearly 30 interviews laced throughout the film, fashion bigwigs like Manolo Blahnik and Diane Von Furstenberg, as well as former employees and family members who knew her on a more quotidian level, recount her inordinate amount of creative vision and the power she had to inspire others. That isn’t to say financial success wasn’t important. As Diana herself say, “Money is vital! VITAL!” After all, she started her career in magazines not because she was well educated—she never made it past middle school—and not because of her professional experience—she had never worked a day in her life—but because Camel Snow, the editor in chief of Harper’s Bazaar, noticed what she was wearing out dancing one night. “Chanel, of course,” Diana chimes at the end of one of her many personal anecdotes taken from interviews she did with George Plimpton (who edited her autobiography). Thus began her journey from New York party girl to fashion editor of Harper’s Bazaar to editor in chief of Vogue (and beyond). It can be hard to keep up at points—not with the plot, but with the amount of inspiration that Diana can still strew over an audience. As for Lisa, when asked to sums up Diana in a word, she says, “rebel,” as everything about Diana from her voice to the rouge she applied on her ears was unique and without apology. There’s just enough negative, such as her shortcomings as a mother, to keep her human, but the film is as much a tribute as a documentary. The Rolling Stones’ “She’s a Rainbow” plays through the opening credits. In hindsight, the choice a pretty appropriate for someone whose life arched over the fashion industry: a colorful constant that never failed to amaze.